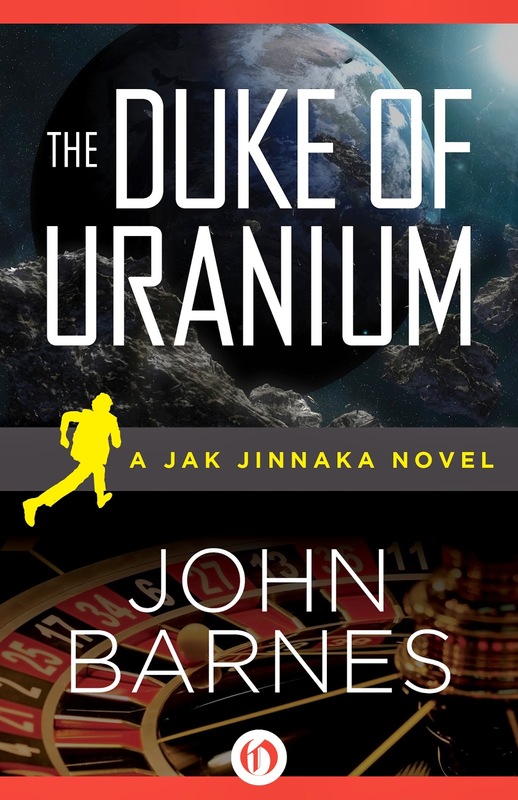 There's this friend, whom I will call John Johnston because that's his name, with whom I share very little in the way of politics, a great deal in the way of artistic tastes, and kind of a mixed bag on hobbies. It happens one hobby we share is spy-watching; I'm assuming most of you know that much of what determines humanity's future happens in little administrative offices and cubicles, or in quiet offices on university campuses or military bases, or overhead in space, and very occasionally leads to some action here and there but mostly is just an endless unacknowledged game between all the nations of the Earth. If there is going to be genuine autonomy and liberty for the species, ever, it will have to close down some day, but it seems very unlikely to happen within my lifetime or even that of my grandchildren. Most of the time, spy watching is rather like trainspotting, or bird watching; oh, look, there's one now, talk to your friends about whether everyone saw it, that's that, no consequences. Neither John nor I is a particularly keen spywatcher; we both have other hobbies we give more time to. But now and then something interesting happens and even more rarely it comes leaping out onto the front pages, and just as the birdwatching community wigged out and let everyone know a few years ago when it looked like the ivory-billed woodpecker might still be with us after all, the spywatchers get excited enough to talk about something. This time, for Americans anyway, it might actually be something important, and since the USA tends to be a pivot point the world swings around, maybe for the rest of you. So let me lay it out as I see it. Today's Washington Post revealed that the DNI -- Director of Naval Intelligence, #1 spy guy in the US Navy's Office of Naval Intelligence, which for historic reasons tends to be the seniormost and most influential of the US armed service intelligence agencies -- Ted Branch, has been suspended and his access to classified information at least temporarily shut down, due to the rapidly widening corruption and bribery scandal surrounding Glenn Defense Marine, a Malaysian company that seems to be rather spectacularly corrupt. Branch's chief deputy/assistant, Bruce Loveless, director of naval intelligence operations (the guy who makes sure the DNI's orders are carried out) was suspended at the same time. That's the highest the scandal has reached, but that's plenty high; the DNI reports directly to the head of the DIA and to the Secretary of the Navy, each of whom report directly to the Secretary of Defense, and it's a level at which it's not unusual to be asked to testify before the secret Congressional committees or the Cabinet, or to brief the President. Branch and Loveless have not been convicted of anything, yet, of course, but the Washington Post is doing that ambiguous dance they do when they know charges are pending but can't quite say so. Other people who have already been charged -- including one from the supposed-to-be-the-watchdog NCIS -- are accused of having passed on information about ship and submarine movements to Leonard Glenn Francis, a Malaysian often called "Fat Leonard," who heads up Glenn Defense Marine. His ostensible reasons for buying the information is that his company is a major supplier of services (tugboats, fresh food, etc.) to the US Navy in the Far East, and he was buying his way to an unfair competitive advantage. Here's the catch, which gets us spywatchers really interested: the Malaysian corporate world is absolutely crowded with overseas Chinese, who in turn have a web of family connections back to the mainland. What you say to a Malaysian shipping, harbor services, or other maritime company exec on Tuesday morning is going to be discussed in Beijing by Tuesday lunch. Please note I have no kick against any Malaysian or Chinese involved in this. They have their interests and purposes, they're pursuing them, international politics is not a game of Candyland, and they're doing what any cunning businessperson or smart spy would do for his or her company or nation. But I do have a kick with their American suppliers. Because the information they were selling was not just about getting towing and salvage contracts for an ambitious foreign company; it's about the movements of the Seventh Fleet (and probably the Third and Fifth as well), and if things go bad in the Pacific, that could make an enormous difference. And although the Navy is saying, right now, that Branch and Loveless broke the rules back before their present appointments ... well. You don't go to DNIO and DNI straight from aircraft maintenance, or the Seabees. Anyone in either office has been a spy or a spymaster most of his career. The dangers of sharing any information with a Malaysian business has to have been screamingly obvious; there's no way this was unwitting. Nor do I suggest that Branch and Loveless were directly working for Chinese intelligence. I'm perfectly willing to believe they simply sold information to a leaky third party for the money. Money is historically the most common motivation for American traitors. Ooh. Ugly word. Should I be saying that word? But look, folks, here's what's right there in public: two admirals who must have spent most of their careers in naval intelligence (whether openly or not) are being investigated for having taken money from a foreign company that, if it is not actively aiding Chinese intelligence at the corporate level, is surely so penetrated as to make no difference, and they can hardly have avoided knowing it. It was their business to know it, for most of their careers. And the information shared included ship and fleet movements -- the very core of what are usually considered defense secrets. Just on the face of it, what they did is far more prosecutable than anything Snowden did. Ethel Rosenberg went to the electric chair for less. Now, there's a constitutional argument about whether or not "giving aid and comfort to the enemy" is a separate requirement for treason from "adhering to the enemy," and it's relevant because these guys very likely committed the former but not the latter (assuming they haven't been framed or there aren't other mitigating circumstances as yet unknown to the public). There's another argument about whether giving intelligence to a third party that you know is going to leak to what is, after all, a major trading partner and a nation with which we have fairly good relations, but which would be our most dangerous enemy if things change, is at all the same thing as doing it with "the enemy." So maybe a charge of treason is a step too far. But we were at peace with the USSR when the Rosenbergs were electrocuted, and we'd been allies with them when they committed their offense. And Snowden, after all, distributed the information to the world, trying to put an end to something he saw as unjust; in no way could he be construed as trying to assist in an attack on the USA, or even in making it more likely. If the treason laws can stretch as far as them, it can stretch to these two admirals. So here's what I'd like to think might be happening: President Obama and the leadership of both parties in Congress -- (Boehner and Pelosi, Reid and McConnell) ought to be having a quiet conversation that will go something like this: we have, or probably have, deep, dangerous, and pervasive rot at the top of our professional defense/intelligence community. We must know how far it goes. Just to sift the evidence is going to take (if this case is typical) at least most of the rest of the Obama Administration, and prosecutions and trials may well continue till 2020 or so. So here's the deal: no deals, and no politicization. Obama and Holder start the investigations and work them as hard and as long as it takes. Next administration takes over and continues them. Whether anyone has a D or an R after his/her name, we keep catching rats till there are no more rats to catch, and we clean this up. Because, if you haven't noticed, dear readers, and everyone else: this is really, really bad. I'm not a lawyer, but it reeks of treason. And if our highest ranking officers are let off the hook for it ... well. the eagerness and ease with which some high ranking French generals joined Vichy? the movement of so many senior Army officers into the army of the Confederacy? the German judges who let the Nazis go free? the speed with which Franco made the army his own? Pick your analogies where you will. But we've got rats, and they're not Republican or Democratic rats, they're just rats. You all can fight about guns and abortion and health care later. Get on the big job, make the deal, and preserve the country. That's what we hired you to do. Open Road has now made Kindle editions available for the first 3 Jak Jinnaka books. Unlike the old cleaned-up-downloads-from-the-Warner-Books version, these have had an actual editor, and they have covers that have something to do with what's in the book! Readers who approve of courtesy to living authors will read these and no others! sometime in the spring, look for Jinnaka #4, Mutiny on Umbriel's Glory. Because something I've said in the newsletter is proving to be true: in this new age of publishing, no series is dead until both the writer and the fans want it to be. More about this soon, including some cover images, but since I'm feeling pretty happy about all this, I thought I'd put it out here to celebrate. One benefit of being back in the saddle of a real teaching job (and an interesting one, too, these kids are fascinating in so many ways) is that I have many more ideas and more interesting ones than I did. One major drawback is that I no longer have time to write them down. 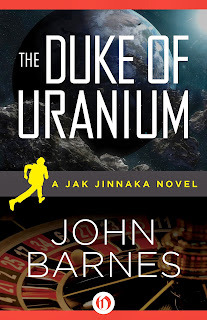 So, for the moment ... a bit of news: Open Road Media, the same people who brought Encounter with Tiber back out, are re-launching my old Jak Jinnaka series, beginning with The Duke of Uranium. Well, actually I'm quite certain that I know absolutely nothing about how it will turn out. But I am also certain it's much more in line with what I wish book publishers had been doing all along. Newsletter readers received a rather lengthy discourse about how I thought Jak Jinnaka was mismarketed (and how it happened to be) when he first appeared 11 years ago. I guess if any of you who don't subscribe to the newsletter but want to read about book mismarketing at length were to drop me a note I'd shoot you a copy of that back issue. But the super-short version is this: marketing of course directs readers to books they are likely to buy, but its more important function is to tell them how to read and like the book -- accurately. Any time a reader is tricked into something they won't enjoy, it hurts all of us writers and readers; any time a reader is steered away from something they would like, or worse yet coached into reading it as something they won't like, that's an absolute disaster. The marketing is as much a part of the work of art as the work itself (see my articles in the Oxford Encyclopedia of Theatre and Performance on Publicity, Playbills and Programs, and on Posters for a somewhat technical discussion of all that). So hurray for the new Jak. I don't know if you'll like him, or if anyone will, but this time he's being marketed, promoted, and sold as what I intended him to be: an amoral rascal perpetually surviving on single-minded selfishness, low cunning, and a hopefully-comic amount of dumb luck. And The Duke of Uranium is his origin story, not the beginning of a YA franchise. 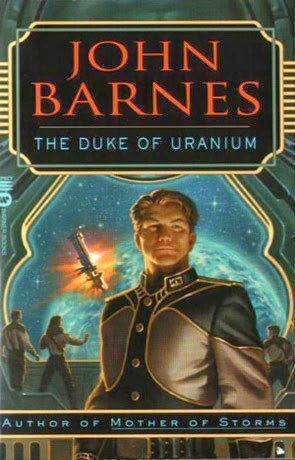 And by contrast, here's the old cover, which said "Heinlein YA pastiche about a likeable young man with potential" in the way that only Howdy Doody in a high school band uniform can.